Johannesburg - The Hawks will conduct a preliminary investigation into allegations that SA Football Association head Danny Jordaan was involved in the funneling of a $10 million bribe to host the 2010 Soccer World Cup in South Africa. Hawks spokesperson Brigadier Hangwana Mulaudzi on Thursday said this decision came after a request from an opposition party. ''The Freedom Front Plus came to us on Tuesday and dropped off some documents demanding that we look at them,'' said Mulaudzi. ''We are going to have a preliminary investigation based on the information they have given us,'' he said. He said the right to request an investigation on anything was available to any member of the public, or political parties. They had not been approached by the Federal Bureau of Investigation or US authorities on the controversy yet. He said that the FF Plus said their request was based on information they claim to have regarding SAFA officials. Asked whether the Hawks had initiated its own parallel investigation, he said the specialist police unit did not have jurisdiction, but if Parliament's justice cluster decided it was necessary, it would do so. FF Plus said its parliamentary spokesman on sport, Anton Alberts, had received confirmation on Wednesday that the Hawks would investigate. 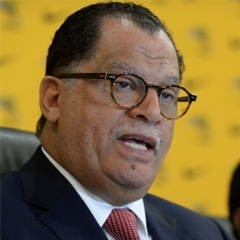 Alberts had asked that the Hawks examine allegations that Jordaan, who was recently appointed Nelson Mandela metro mayor allowed $10 million to be paid to the Confederation of North, Central America and Caribbean Association Football (CONCACAF). ''He said the Hawks confirmed that the investigation would be done in conjunction with the American Authorites and the FBI which are already investigating,'' FF Plus said in a statement on its website. At a press conference where Jordaan and Local Organising Committee member, and then SAFA president Molefi Oliphant, pulled out at the last minute, South Africa's Minister of Sport Fikile Mbalula on Wednesday denied that the money paid in 2008 was a bribe. US and Swiss authorities are investigating the matter and several FIFA officials have already been arrested and charged with racketeering, wire fraud and money laundering. Jordaan has confirmed that the money was paid from the tranche South Africa was to receive from FIFA, but denied it was a bribe, according to a report in the Sunday Independent. On Wednesday, millionaire Chuck Blazer entered the fray when court testimony released alleged that he had conspired with FIFA executives to accept bribes during the process to choose hosts for the 1998 and 2010 Soccer World Cups. He admitted to the charges, according to a report by Agence France Presse.